If there was one word to sum up the latest film in the sci-fi-action-horror series The Chronicles of Riddick, it would be “meh.” The movie really does not evoke any strong emotions, positive or negative. It does manage to have a somewhat entertaining plot, but it flounders in a sea of bland characters that leave no impression. Riddick’s main crime is that it is just forgettable. Nothing about the film is particularly memorable because it never comes close to getting the audience invested in its characters or plot. Right off the bat, Riddick decides not to waste time on that pesky character development. Instead, the plot and dialogue only exist as a way to connect scenes of the titular space warrior (Vin Diesel, The Fast and the Furious) killing people. This lack of knowledge of the characters in a movie, in which the majority of the cast dies, presents a problem. If not enough time is spent on character development, then why should viewers care when those characters die? It is almost as if characters come in from one side of the screen and exit through the other without making any impact on the film as whole; their fates are glaringly obvious from the beginning, leaving audience members bored at best. The way to get audiences emotionally invested in a film’s characters is to develop their personalities and give them motives. Unfortunately, Riddick never does this. The screenwriters and director clearly do not care about them enough to make them meaningful, so the audience is ultimately left with little to grasp as the film progresses. Another issue with the characters is that they are not very likable to begin with. 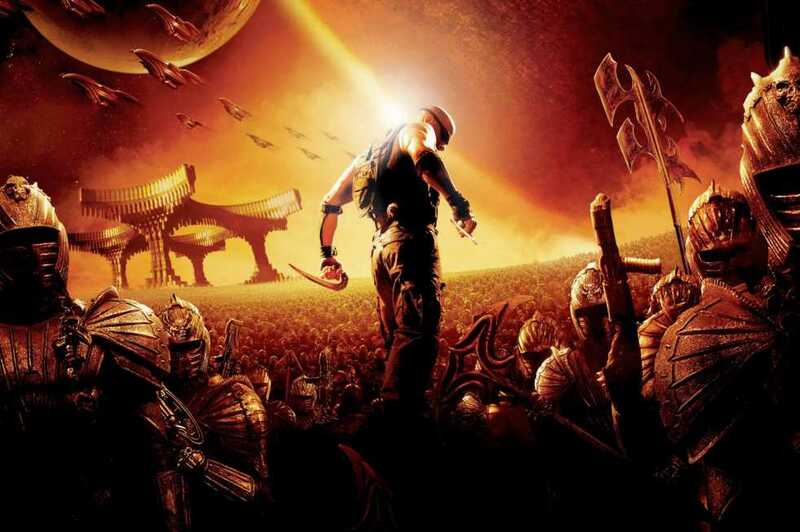 In the harsh, monster-infested world of Riddick it would be understandable if a few characters were not exactly optimistic all the time, but most of them come off as mean-spirited for no good reason. If the characters were backed by stronger development, they could establish pasts and motives that would make them more sympathetic and therefore more relatable. This movie never bothers with that, though. The only character that gets any sort of interesting motive is Johns (Matthew Nable), but his is never fleshed out, and is eventually dismissed by Riddick in about a paragraph of dialogue. The problem is that the characters aren’t framed properly. Audience members can barely root for Riddick, and he is supposed to be the hero. This creates a problem when the situation is life or death, because when such a situation arises, viewers just might not care. On a more positive note, Riddick is somewhat redeemed by its plot. To its credit, the plot is not predictable and even manages to be interesting at times. Although it is just a series of events leading to a string of bloodbaths, sometimes the bloodbaths can be satisfying. The kill scenes can be gritty and impressive and the pacing does build some suspense. The story may not be very intelligent or thought provoking, but it does create an enjoyable result- a simple, non-challenging escape film. Riddick isn’t going to raise, much less answer, any important questions, but it can provide an entertaining two hours. If you can go in, sit down and shut off your brain, you will not have too many complaints. Riddick is entertaining, but mostly it will just go in one ear and out the other. The acting is fine, and the characters are passable, even if they are bland. Viewers looking for a serious, intelligent film that works more as a character piece should back away slowly from this flick. Anyone looking for a way to waste a Saturday afternoon with a few friends, though, should grab a ticket.